Premier Auto Trade has announced the release of a new WALBRO high performance in tank fuel pump designed and developed especially for E85 fuel. This new fuel pump is designed for engines with more than 500 HP and features award winning OEM technology. The new WALBRO High Performance pump outperforms all current market in-tank fuel pumps, with all its pumping components validated to OEM specifications for approved use in E85 / flex fuel applications. The WALBRO E85 pump offers high pressure high flow performance with over 450 L/Hr possible. E85 fuel offers a higher effective octane rating of 108 over conventional premium unleaded fuels; it provides a number of advantages including improved performance and reduced engine heat and wear. Premier Auto Trade can also supply alcohol friendly components suitable for use with Methanol and Ethanol based fuels. Premier Auto Trade also has a direct high flow performance fuel pump available for VE Commodores. 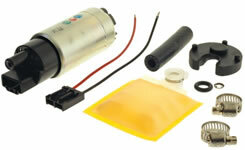 This high performance fuel pump can easily replace the existing fuel pump without any modifications required. Delivering a flow of 265 L/Hr compared to the standard vehicle pump at 180 L/Hr this OE quality high performance pump delivers great performance. Premier Auto Trade is a leading wholesaler of quality engine management and service components and offers high quality performance products including Fuel Pumps, Fuel Pressure Regulators, Fuel Injectors, Fuel Filters, Engine Management Systems, ECU Components, Boost Controllers, Blow of Valves, Wastegates, Air Filters, Silicon Hoses, Alloy Products, Gauges and Performance Accessories from some of the world’s leading manufacturers including Bosch, Delphi, VDO, Walbro, Rochester, Pierburg, Denso, Haltech, Aeroflow, UNISIA JECS, Malpassi, SARD, Standard Motor Products, Hitachi, Walker Products, Fuel Lab, Turbosmart and BMC Filters.